*Peel mango and dice it. Chop chilies, cilantro and ginger into small pieces. Thaw coconut if you are using frozen. Put everything in wet grinder. Coarse grind, using very little water. Adjust seasoning. Serve with idlis, adai, sandwiches. * Usually I make this raw mango daal and use flesh around seed to make this chutney. 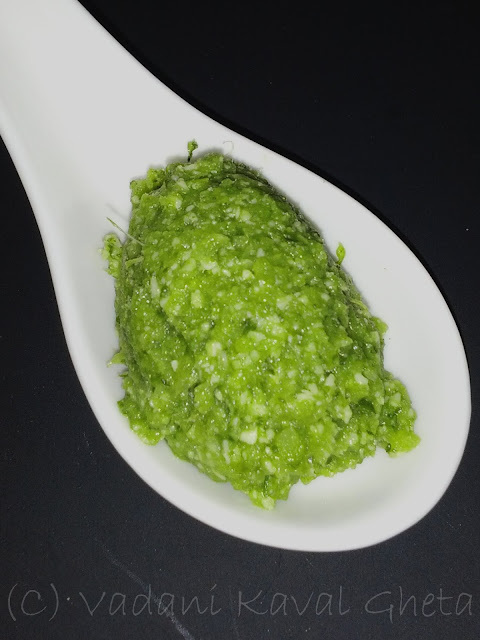 You can make Mint chutney by adding 1/4 cup mint leaves. I occasionally add tempering of 1tsp oil, mustard seeds, hing and curry leaves. I love this mango chutney. That tangy taste of raw mango is just great! A little asafoetida in the seasoning is also nice.